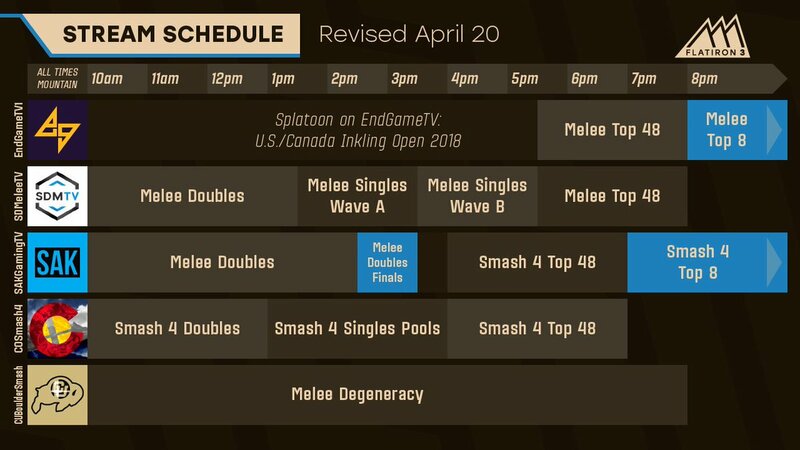 Stream: SDMeleeTV, SakGamingTV, CUBoulderSmash, and EndGameTV1. It’s a weird schedule. Featuring: Leffen, Axe, SFAT, S2J, Crush, Zain, Westballz, Swedish Delight, Lucky, PewPewU, HugS, lloD, Syrox, KJH, Captain Smuckers, Rishi, Bladewise, Slox, ARMY, Rocky, Captain Faceroll, Medz, Spark, Kalamazhu, Tai, homemadewaffles, Bobby Frizz, Iceman, NMW, R2DLiu, Rustin, Zoso, Alex19, and a lot more mountainous players. Featuring: Plup, Ryan Ford, Ginger, Colbol, Abate, Squid, Drephen, Cal, Rik, KPAN, Moky, Reeve, Fizzle_Boy, TheRealThing, Harriet, Boyd, Sirmeris, Papa, Fluid, Polish, Zamu, Spy, Holiday, and more Clevelanders. Featuring: La Luna, Iori, Cob, DairDeviL, Davemon, Mewwy, Thexy, Den, Xtreme, Wolven, and Gucci Mane like for real. Featuring: Kalvar, th0rn, Joyboy, dudutsai, Klaps, BigFoig, Yasu, bonfire10, Younger, Mr. Lemon, Rasen, Ses, Project, BonkCushy, ThunderPaste, Bank, Spiff, Red Rice and probably more good New Englanders. Featuring: Chef Rach, Eikelmann, Sinbad, Tempo, It’s a Wonderful World, Noghrilla, JRad. Featuring: Aza, Valdo, .jpg, Rael, Maxinho. Featuring: Shippu, Sanne, Sheik, S-Royal, Da-Yoshi, Shuta, bitou, Tanzanyte the Awakener, Plata, Watch. Featuring: Maknae, Hippo, PC Jeff, W3EM, more of ranked Nova Scotia, and part of this tourney is on Saturday but I can’t see a schedule. Sam “Dots Haver” Greene can be found on Twitter @SSBMDingus.